Chemically known as “calcium sulphate dihydrate”, gypsum (CaSO4·2H2O) is a soft sulphate mineral containing calcium, sulphur bound to oxygen and water. It is a by-product of the evaporation of lake and seawater and, in its natural form, occurs in sedimentary rock formations. The non-toxic material has been used in the construction industry as far back as ancient Egypt and is still very prevalent today - especially in countries such as Spain, England, Turkey, Russia and the USA. Gypsum is used mainly to create dry walls, plaster and plasterboards. It is also used as the base for cement; to treat agricultural soil; and even in tofu. The rock is mined or quarried then crushed and ground into a fine soluble powder. 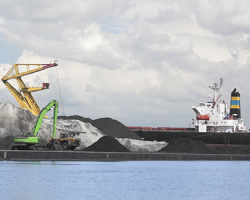 In a process called calcining, gypsum powder is heated to approximately 350 degrees F, driving off three fourths of the chemically combined water. The calcined gypsum, or hemihydrate, becomes the base for gypsum plaster, gypsum board and other gypsum products. 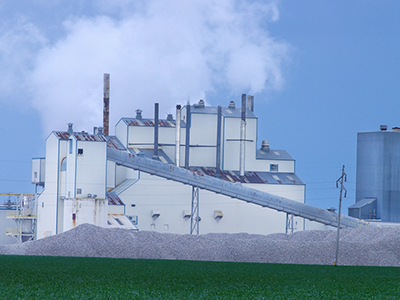 An effective alternative to natural gypsum is superficial gypsum (FGD) which is a by-product of flue-gas cleaning in fossil fuelled power stations. 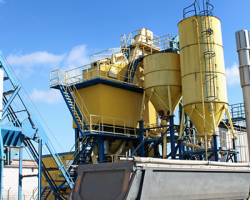 What challenges does the Gypsum Processing Industry face? 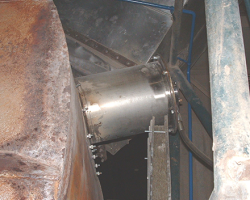 Cement plants can experience severe flow and operational problems with their gypsum bin. These flow problems significantly impact productivity, create housekeeping and safety issues, and require limited available manpower to spend significant time tending to the problem. Since gypsum processing is usually a multi-stage process, it’s vital to ensure that the correct moisture levels are achieved at each step. The end goal of gypsum palletisation is not only to create a homogenous mixture, but also to ensure that moisture is drawn out of the product. Therefore, if moisture levels are not monitored effectively, the end results will be less than desirable. Gypsum’s natural ability to harden into a cement-like form can make it difficult to remove from equipment. 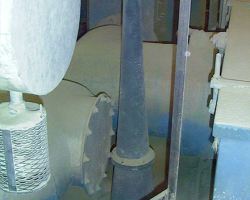 If left untreated, gypsum build-up and clumping will eventually wear down moving parts and result in maintenance issues for processing and material handling equipment. Consistent removal of material build-up is recommended in order to counteract the issue. Costly site downtime and expensive equipment failure are all results of unmaintained appliances. However, the preventative nature of Primasonics Acoustic Cleaners can help to minimise equipment failure and reduce the amount of repairs needed. How can Primasonics solve issues in Gypsum plants? 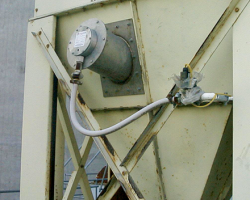 By introducing an Acoustic Cleaner on top of a silo or mixer, side wall build-up is eliminated. Likewise, installing an Acoustic Cleaner at the silo discharge ensures that bridging is prevented, and maximum discharge flow is achieved. Over the years, industrial cleaning technology has made great strides in developing faster, easier and more efficient cleaning methods. As one of those methods, Acoustic Cleaning utilises very diffractive low frequency sound waves in order to reach more surface area than other devices. This means that Acoustic Cleaners can clean surfaces whilst maintaining thermal efficiency and differential pressure.